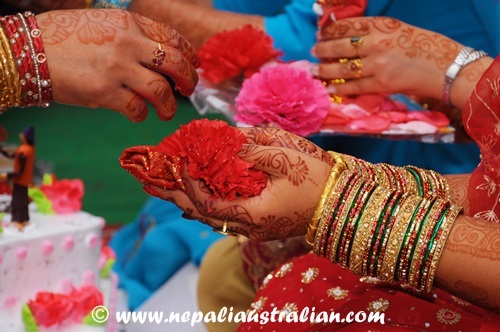 The Supari is the Newari equivalent of the engagement ceremony in western weddings; a formal announcement/acceptance of the relationship. The bride’s family isn’t able to proceed with any of the wedding parties until the Supari is received from the groom’s side. 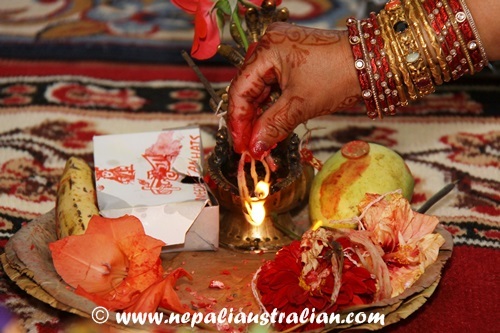 Supari is the Nepali word for betelnut and the deal is sealed by an event called ‘Gway Bigu’ or the sending of 12 pieces of supari (betle nut) from the groom’s family to the bride’s which is used during the “Swayambar” ceremony. The family of the groom-to-be also presents a set of clothes along with jewellery, lots of rotis, fruits for the bride as a sort of first gift to the soon to be daughter-in-law. 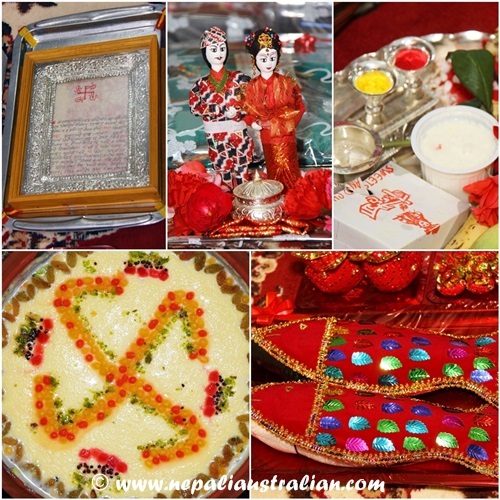 In most cases, this supari-taking ceremony occurs four days before the actual wedding ceremony, but it can be earlier or later to suit the families. When I woke up that morning, I had butterflies in my stomach. I was relaxed before but suddenly I was a bit scared as it was getting very real with the upcoming Supari ceremony. It is funny how you can easily get overwhelmed by the situation looking at what is happening around you. My house was full of people, relatives and friends. It was noisy and everyone was busy doing something or other. They all seemed to be busy but I didn’t know what I was supposed to do. I asked my mum what things are to be done before I go to beauty parlour to get ready. She asked to have breakfast and go so I can come back as soon as possible. I had made an appointment in nearby salon and the lady had told me, it would take up to 3 hours to do my hair and makeup. When I came out of the parlour, I felt like a real bride. 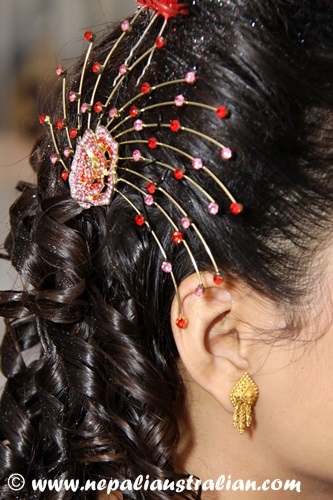 I was wearing a red sari with green border which had golden work done with beads. 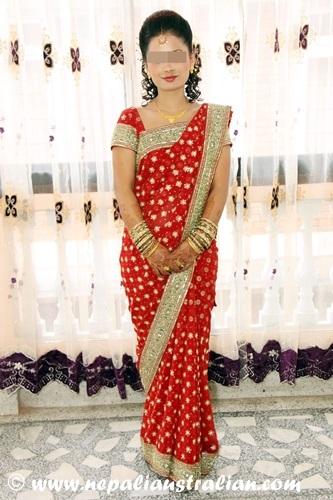 I had bought this sari while I was in India and loved the simple style and the border. I had my hair made up in a bridal way complementing my bridal makeup. I wore lots of Chura (glass bangles) to match the sari. I also wore a gold necklace set and golden chura my parents had made as part of my wedding jeweleries. My friend came to pick me up when I was done. From there it was straight to the venue where Supari ceremony was happening. As we were early and the photographer was already there, we had the opportunity for some photos. I am not sure what I was feeling because it was the first ceremony with so many people and things started to get more real. Then most of the relatives and friends started to come. The groom’s family informed us that some of the family members were on the way for Supari ceremony. Like in most Asian society, wedding is the time when the family status is displayed by showering the bride with expensive jewelleries. My parents and MIL had made sure that nothing was spared in planning so I was getting lots of jewellery from both side of the family. 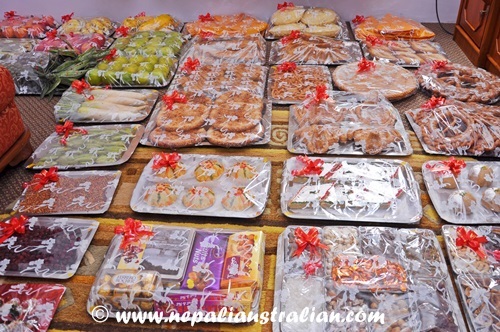 For this occasion, the groom doesn’t come but had sent his 4 cousins with trays of gifts like jewellery, Saris, cosmetic, shoes, bags (I went shopping with my mother in law beforehand and she let me pick everything of my choice which was so nice of her), fruits, Nepali Roti, Masala and much more. 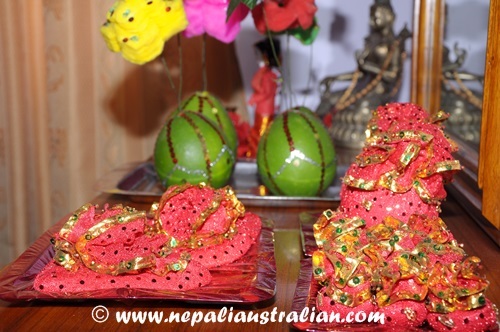 There was Supari (betle nuts) and coconut nicely decorated in red clothes and beads, fish decorated with lots of glitter, and decorated yogurt. One of the biggest highlights was the cake(remember all the drama I had to get this cake done and I am so glad the final outcome was so good). 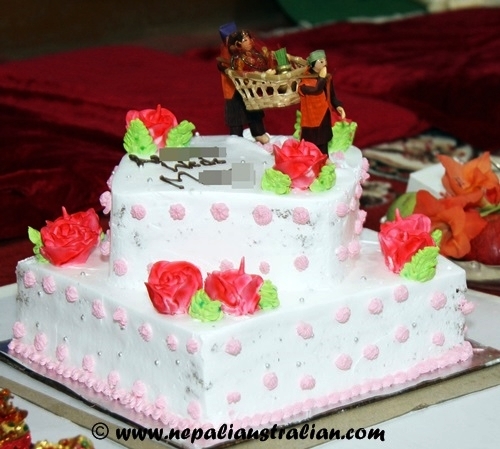 It was a white forest two level cake with a traditional topper (two men carrying bride in Doli) . Everyone loved it. I am glad we selected that. There was a diamond necklace with earrings, a pearl set and the important Tilhari (necklace made of small pote beads with a gold pendant) and Sindoor (Vermilion). But the most important out of all this is Sahit paper (The paper which has the details of date and time for our Swayambar). An astrologer decides on an auspicious date, or Subha Sahit, after gauging the influences of the celestial bodies on the bride and groom based on the dates and times of their birth. Fixing the date is but an end of a long, tedious process of setting everything on a right course. Preceding it are labyrinth of activities, like matching of kundalis and comparing and cross-checking of gotras, or ancestral lineages, of the couple. The Sahitpaper was framed nicely in a silver frame. The ceremony started with my aunt (eldest woman in the family) doing some Puja and then they handed me all the gifts including Sahit paper, Sindoor and Tilhari. The priest was instructing my aunt on what to do and with the help of my mum the ceremony was concluded. I was so preoccupied during the ceremony that I missed lots of the things that happened. Luckily, there is a video as well as photos for me to relive all the wonderful memories from the day. I wore all the jewellery and some glass bangles. Then it was time to cut the cake. 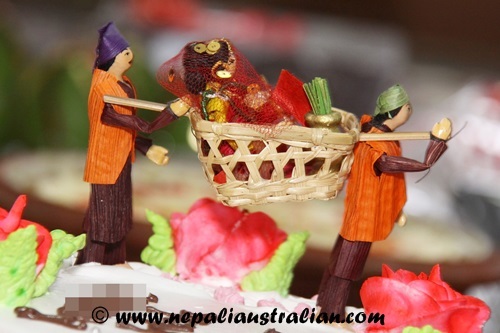 In Newari wedding, both the cakes are cut by bride herself. I cut a cake and it was given to everyone. A big piece that said A weds M was sent for AS so he can have later. 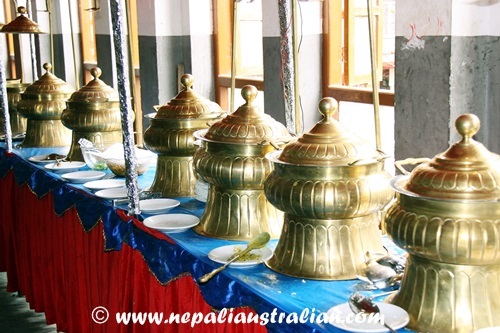 As you know, no ceremony in Nepali culture ends without the big Bhoj (party) so there was Bhoj and refreshment for everyone including AS’s cousins. It was a simple ceremony but it had a great significance as it formally started the wedding 🙂 . 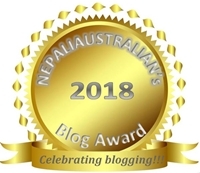 This entry was posted in Marriage, Nepali Culture, Our Story, Our Wedding and tagged australian nepali, betelnut, Bhoj, Chura, Doli, family, Gway Bigu, kathmandu, kundalis, love, love story, M from nepaliaustralian, Masala, Mehendi, move, Nepal, Nepalese wedding, Nepali, nepali australian, Nepali Roti, Nepali Tradition, nepali wedding, Nepaliaustralian, newari, newari wedding, our love story, photographer, Sahit, Sari, Sindoor, Subha Sahit, Supari, Swayambar, Syte paper, Tilhari, Wedding. Bookmark the permalink. Wow you almost need a degree to learn how to get married. Yes, Nepali/Newari culture is complicated but so meaningful and beautiful . I loved our wedding and learned so much in the process.